We live in a world that is defined by three spatial dimensions and one time dimension. Objects move within this domain in two ways. An object translates, or changes location, from one point to another. And an object rotates, or changes its orientation. In general, the motion of an object involves both translation in all three directions, and rotation about three principle axes. Displacement is a vector quantity, which means that displacement has a size and a direction associated with it. The direction is from point "0" to point "1". The individual x-, y-, and z-displacements are the components of the displacement vector in the coordinate directions. All of the quantities derived from the displacement are also vector quantities. When we initially specify the location of our object with x0, y0, z0, and t0 coordinates, we should also specify an initial instantaneous velocity V0. Likewise at the final position x1, y1, z1, and t1, the velocity changes to a velocity V1. Again, for simplicity, we are considering only the x-component of the velocity. In reality, the velocity changes in all three directions. Velocity is a vector quantity and has both a magnitude and a direction. 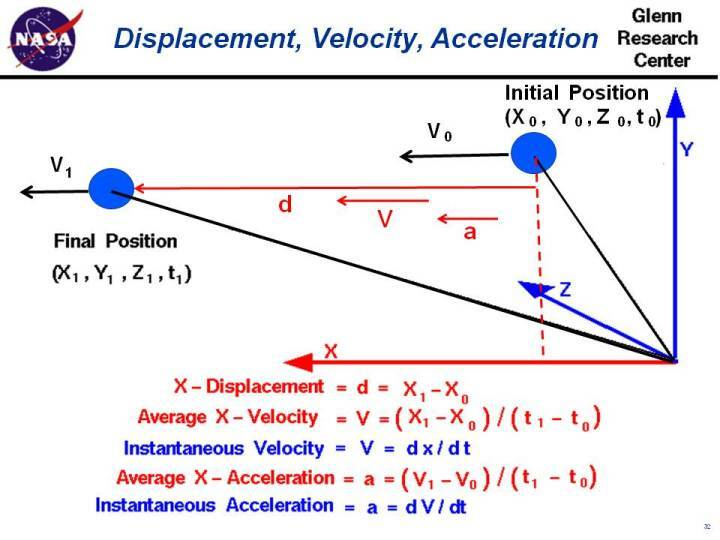 The direction is the same as the the displacement direction from which we defined the velocity. From Newton's second law of motion, we know that forces on an object produce accelerations. If we can determine the forces on an object, and how the forces change with time, we can use the equations presented on this slide to determine the acceleration, velocity, displacement and, therefore, location of the object as a function of time. Aeronautical engineers use this information to predict the motion of an aircraft, or the flight of a rocket.